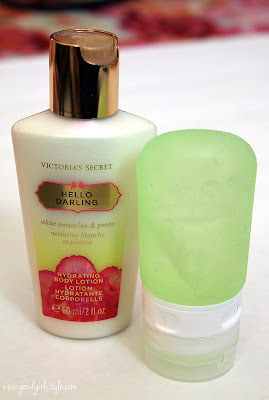 Since it is winter now, these two babies are my absolute essentials: Lotion and hand sanitizer in the cutest, most useful little tube from HumanGear. 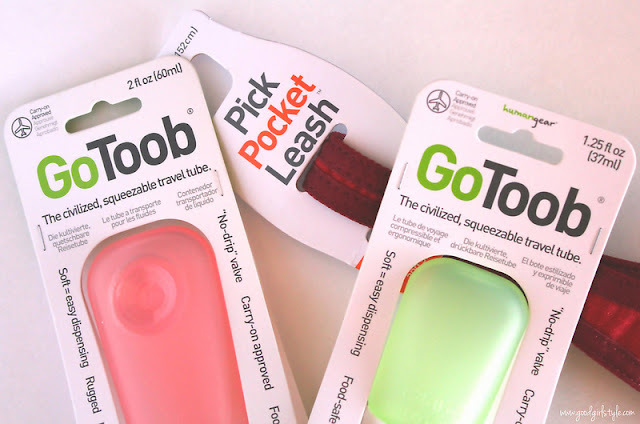 When they shared a leash for Lottie, they also sent me two of their GoToobs, the civilized travel tube. So I just have to tell you about them for a minute here because they are awesome! These beautiful, silicone tubes are so intuitively designed, they are sure to make travelling a much smoother experience. When I saw they were recommended by my favorite travel expert (the adorably pregnant-with-twins Samantha Brown), I knew I had to try them out. What makes their tubes so fantastic? To begin with, they are squeezable. If you've ever had cheap "travel section at big box store" plastic containers for travel, you know that they are rigid and prone to leaking. And forget about ever cleaning all of your lotion outta there! Let's be honest, you usually end up throwing them away after a trip because they are so inconvenient, right? No longer! These GoToobs make a great gift for yourself or any intrepid traveler. They'll love you forever, I'm pretty sure. 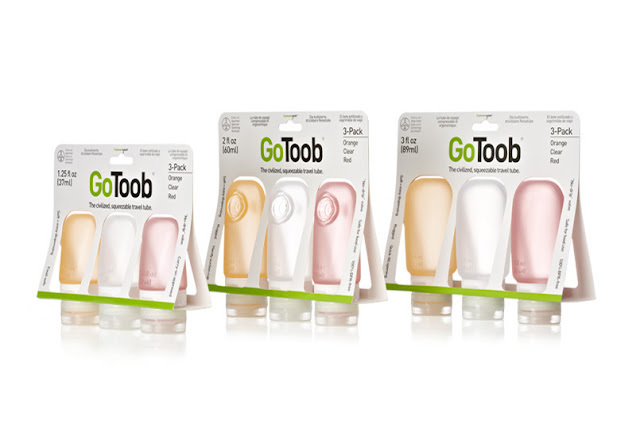 And I do mean forever, since GoToob offers a lifetime warranty on their products. Look how pretty they are! Love the pink, orange and clear. 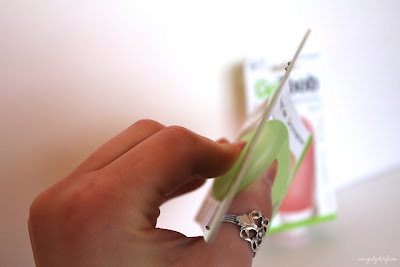 They also come in blue/green/clear, all in 3 sizes (Small - 1.25 fl. oz., Medium - 2.0 fl. oz., and Large - 3.0 fl. oz.). 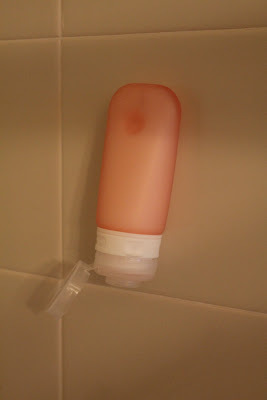 They have a no-drip valve, a wide opening so you can get in there to really clean it out and reuse it, a special built-in labeling system so you'll never put body wash in your hair again, the medium size has a suction cup to stick to the shower (! ), and they are all BPA- and PC-free and FOOD GRADE. So you could put your special barbeque sauce in one to bring it camping. You could use it for toothpaste, then conditioner, and then you could use it for spicy mustard! I mean, it's just so cool. The medium, filled with shampoo, easily attaches to the shower wall via the built-in suction cup. Ready & waiting for my next trip! 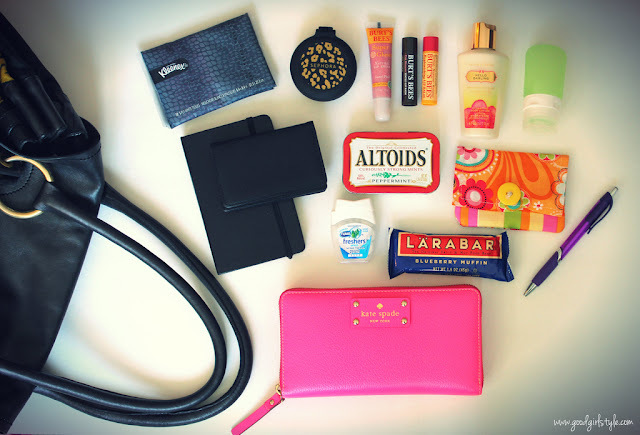 What are your purse or travel must-haves? *Thanks to Katrin at HumanGear for her awesome customer service and for providing me with these products for review. This post is my honest and unbiased opinion. Oh - I love the idea of those Go Toobs! I'll have to try them out for my upcoming trip overseas.